Anzac Bridge in Sydney, Australia has a main span of 345 metres, and a total length of more than 800 metres. From two 120-metre-high towers, 128 stay cables support the reinforced concrete deck. It is the longest cable-stayed span bridge in Australia and among the longest concrete cable-stayed span bridges in the world. This image belongs to the travel and nature stock photo library. 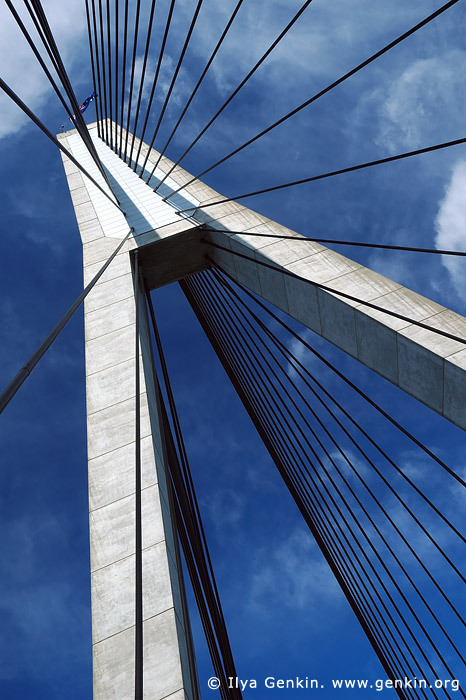 This stock photo of Anzac Bridge Pylon is available for licensing for commercial and editorial uses including websites, blogs, books, magazines, brochures and advertising. Restrictions may apply for images which contain third party copyrighted material or sensitive subjects. Photos of artwork are for editorial use only. This image id AU-SYDNEY-ANZAC-BRIDGE-0003 of Anzac Bridge Pylon, is copyrighted © by Ilya Genkin. This is not a public domain image.